What an awesome story!!! 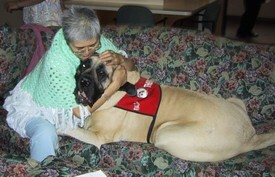 I have been attempting to find more information about therapy dogs. I would like to take my dog and use as a therapy dog!! Great story and great job Fluffy!! Congratulations to you Fluffy! I wish I could have a dog like you! Thank you for being an inspiration tto many.